Although you are limited to carry no more than 14, each club is designed for different distances and heights. If you're a new golfer, one of the biggest questions is often, "Why so many clubs?" And after being awed by the vast number of options available, you're stunned to find out that you can only carry 14 of them. But once you learn there are only a few basic types of clubs available, much of your confusion will vanish. Woods, which are now almost exclusively made of metal or composite materials, are the longest clubs in the bag. They are designed to the ball the farthest and generally result in the ball rolling quite a way after it lands. The club head of a wood is large and hollow and has a curved face. Modern woods are more forgiving, and balls hit slightly off-center will often spin only slightly so they will curve toward where they were aimed. Woods include the driver, which hits the ball farthest and is meant for use off of a tee, and fairway woods, which are designed to hit the ball off the ground. Irons come in a variety of lengths, but all are generally made of solid metal and have flat faces with more loft than woods. They are intended for shots requiring more accuracy than woods; the flat faces and increased loft result in shots that do not travel as far but stop more quickly once they land. Irons traditionally are labeled from 1 to 9 (longest to shortest), but 1- and 2-irons are rarely seen anymore. Wedges are short-shafted, specially designed irons with heavy bottoms and a lot of loft--as much as 64 degrees. When you want to hit a short shot that lands quickly or have missed a green and need to chip or pitch the ball only a few yards to the hole, you usually want a wedge. Typical wedges (from least to most loft) are pitching, gap, sand and lob; most players carry at least the pitching and sand wedges. The lob wedge is often the third wedge added, and some players add a gap wedge if it suits their style of play. Golfers generally carry only one putter. Its purpose is simple--hit the ball into the hole after it lands on the green. Putters are sometimes used from just off the green when the grass is not too tall. The putter has a very straight face, with typically with no more than 5 degrees of loft (about half that of a driver). Some players prefer putters with longer shafts, ranging from "belly putters" to the longest "long putters” or, occasionally, "broomsticks." The hybrid, the newest member of the golf family, is a cross between a fairway wood and an iron. It combines the forgiving hollow head of a fairway wood with the extra loft and accuracy of an iron. While the typical hybrid has a flat face like an iron, some have the slightly curved face of a fairway wood; these are generally labeled "rescue clubs." Sports 1234: What Is Each Club Supposed to Do? What Does a Set of Golf Clubs Consist of? What Are the Different Types of Clubs in Golf? 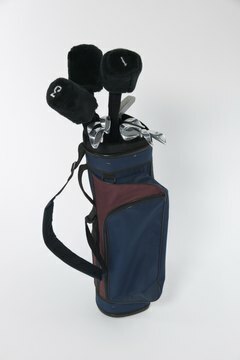 What Are the Various Golf Clubs Used For? What Is Loft in Golf? What Are the Lofts of Golf Wedges?